The Genie Bio Clean system uses an innovative patented and approved 3-point hydrogen peroxide-based cleaning process. 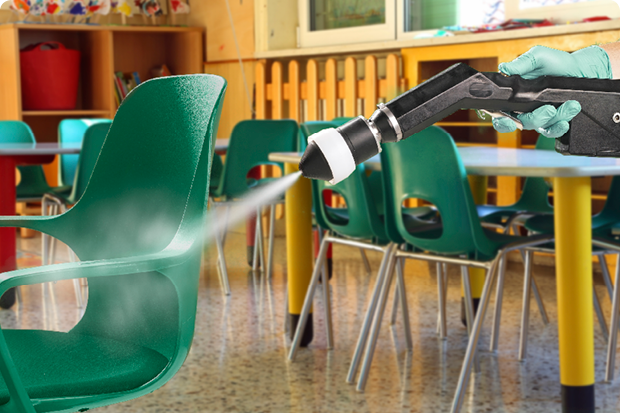 The ground breaking, fogging and electrostatic spraying devices provide proven and effective results against today's disinfection challenges. Our 3-point cleaning system is suitable for almost all enclosed spaces and surfaces in a wide range of environments and applications, including telephones and sensitive computer equipment. The 3-point cleaning system is an advanced and proven infection control cleaning process that combines the 2-phase effect of hydrogen peroxide and silver to CLEAN, DISINFECT and PROTECT, leaving a germ and biofilm free surface as a preventative by-product.